An exquisite, immaculately clean, completely renovated apartment. Private entrance. Bright and airy. Radiant in-floor heating with separate thermostat. Air conditioned with separate thermostat. Quality bathroom and kitchen fixtures. Full kitchen includes all new appliances: full size stove and oven, microwave, dishwasher and coffee maker. 27 inch flat panel TV. Laundry facilities, including washer, dryer, iron and ironing board. We are three minutes walk from a 24-hour bus stop on Ossington. It is a 5 minute ride to the Ossington station on the Bloor subway. It is an 8 minute subway ride to the high fashion shops at Yonge and Bloor. If you stay on the Ossington bus, it will take you to Ossington and Queen within 15 minutes, which is one of the most trendy new restaurant and night club districts. St Clair Avenue is a 5 minute walk, where there are many restaurants and shops. Please note that we can't provide parking on the property but can obtain an on-street parking pass if you require it. The cost is cad$25 for a 7-day pass. Bill is a retired biomedical engineer, and Beth is a retired hospital Administrator. We've lived in Toronto most of our lives. We love the city, and we enjoy sharing tips on the best restaurants and most interesting things to see and do in the city. We like to travel, and have often used apartments listed on VRBO. This experience has given us the ideas that we have incorporated into our apartment listed here. We have tried to anticipate all the needs of travelers looking for quiet comfortable accommodation. Our home is in a quiet residential neighborhood, with good access to public transit. Restaurants, grocery stores, a supermarket and a liquor store are within walking distance. We are 5 minutes walk to St Clair avenue, which has a wide selection of restaurants serving foods of many cultures. There is a Saturday organic farmer's market within 10 minutes walk. Two excellent French patisseries are within 10 minutes walk, and a restaurant that Now Magazine says has 'possibly the best wood-burning, thin-crust pizza in town' is also 10 minutes walk away. There are restful outdoor seating areas in the front and back gardens. There is a private entrance to the apartment. Free high speed internet connection via WiFi. Well lit spacious bathroom with shower and full size tub. Quality fixtures. Heat lamp in ceiling. Heated floor. Radiant in-floor heating with separate thermostat. Shared with 1 Other. Also Iron and ironing board. Automatic drip coffee maker as well as cafetiere. Pots and pans, cutting board, cookie sheet, serving bowls. Full set of dishes, cutlery, glasses, cups and mugs. Cable Channels Include CNN, BBC, PBS, TSN, TCM and Many Others. Radiant heated flooring throughout the apartment. Perfect location for buses, subway or walking. This apartment was great for a solo birthday trip to Toronto! Nice and Cozy, nice residential block, and close to public transportation. I was nervous at first because the apartment is in the basement of someone’s home, but Bill was very welcoming, explained the area and suggested some great places to go and eat. The bed felt like you were in a 5 star hotel, the bathroom had all new appliances (heated floor was a plus) and it was very well maintained. Location is residential so it’s quiet enough to relax, but not to far if you want to go downtown and do some hanging out. There is a little deli store on the corner which sells tokens for the bus. If you don’t want to spend a bunch of money on Uber’s, you can get downtown and back to the house on public transportation for about $6(CAD). Again, great place, great owners and I would definitely stay here again! We thoroughly enjoyed our stay at Bill's place! The home is adorable, apartment is very clean, brand new fixtures in bedroom and bathroom, kitchen is stocked with everything you need including teapot. It was great to have laundry facilities in home - we were able to do laundry on our last evening to returning home with clean clothes! 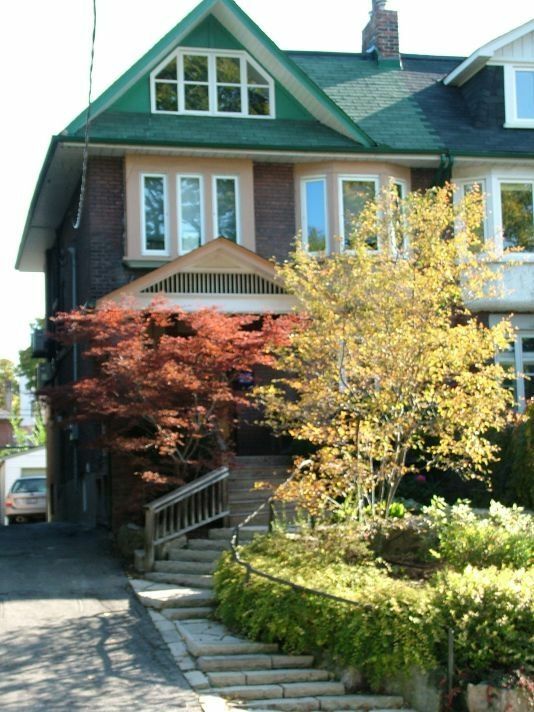 Location was perfect for us - short commute to everything you want to do/see in Toronto. Would love to stay here again. Highly recommend! Anything and everything you could want or need was available. Excellent location- close to transit, shops, restaurants. Bill and Beth were warm, welcoming hosts. They made the whole process from booking to leaving easy and seamless. I would highly recommend this lovely place! Very clean and adequate space for two people. Very nice to have private entrance. This was an extremely nice well kept apartment with everything we needed. Bill greeted us when we arrived and explained the lay of the land. Loved being in a nice quiet neighborhood that was easily accessible to all transportation (buses, subway and streeetcars). We went to two restaurants that Bill suggested and enjoyed them very much. Also walked a few blocks to the grocery store that had everything we needed. The people in Toronto were very friendly and considerate. I would definitely stay here again if we are back in Toronto. We do not have parking on the property, but can arrange for an on-street parking permit @ CAD$25 that is good for 7 days.